Scientists at the German Cancer Research Center have developed a highly sensitive magnetic resonance imaging (MRI) system that can image tumors in the body, without the need for conventional contrast agents or radioactivity. 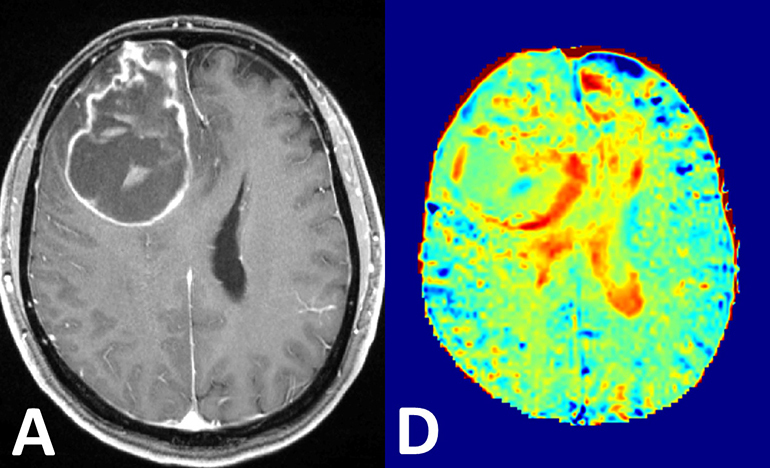 Normally, doctors often inject a contrast agent into the blood before an MRI scan. The contrast agent circulates in the blood stream and can be detected during the scan. However, it doesn’t enter the cells themselves. Nutrients like glucose, however, do. Cells absorb glucose from the blood stream and break it down for energy. However, tumor cells need lots to glucose to maintain their aggressive growth. Being able to compare levels of glucose in different areas of the body should make it easier to see certain tumors that are hungry and therefore are growing aggressively. MRI scanners are generally tuned to see hydrogen atoms, which are found in highest concentration in water. Glucose molecules can’t be seen directly on MRI, but an effect called magnetization transfer can be harnessed to sort-of pass the glucose signal to the surrounding water. The German team was able to monitor glucose consumption within healthy tissue, as well as in brain cancer tumors by simply injecting a glucose solution and performing scans shortly thereafter. Existing methods of detecting glucose uptake in tumors, such as positron emission tomography, involve injecting radioactive glucose. “Our glucose MRI does not require any radioactivity and therefore, does not involve any radiation exposure for the patient,” said physicist Daniel Paech, an author on the study.